We all love potato chips but have you ever thought of the work that is put into making it? Most people go for their potato chips in their favorite fast food restaurants. The reason being they believe the work involved is cumbersome. Making the potato chips is fun but only when you have the right tools. You need the tools to peel and shape the potatoes into chips whether you love them thick or thin. I am a fan of potatoes, that’s why I make lots of potato recipes such as Potato Stir Fry Recipe, Beef Curry With Potatoes, Mashed Potato Cakes. For the Potato Stir Fry Recipe, I always use the slicer to slice the potato. Please watch the short video below and you will know why I always use the tool. Such food is ideal for us with your family around. They can use them as snacks. This article aims at shortening the search time for the best potato chip slicer that you may use in your household. Of course, it’s hard to choose a potato chip slicer from a pool of best ones in the market. But, with the following guidelines, it should be easy to buy one. You will have about three different shapes of the blades. They can be straight, v-shaped or diagonal ones. When you understand the types you have in the market then know the kinds of blades you want the better for you. The all have different purposes to serve and luckily, some of the slicers come with interchangeable blades. This is kind of slicer is an ideal potato slicer because it gives you the best of all the three worlds. These kinds of blades are the traditional kinds which you use to cut your sweet potatoes, butternut squash and tomatoes sometime. You will find them mostly used in French sliders. With this, you have your blade set at an angle thus you don’t have to use a lot of force. You also don’t get injured as when you are using other shapes. They are ideal for use with your soft skin veggies and fruits. Here is your regular use blade for cutting almost anything. It will cut your large ingredients in different shapes. You will even use it for the toughest potatoes. Whenever you are using sharp objects, you should never downplay your safety. The potato slicer should be safe to use because if it isn’t carefully protected, chances are that it will hurt people. If you will get food holders the better for holding the slicer. Keep your slicers safely out of reach for children to avoid unnecessary accidents. Take time to only choose an item that is dishwasher friendly. This is because it will lift off your hands the extra work involved in the cleaning the item. However, ensure it doesn’t harbor bacteria from its hidden corners. You don’t want to buy a potato slicer that is so complicated and make it hard to use the item. Because in all essence if you will spend time trying to figure out how to use it then it ends up being a useless tool. Most of this potato slicers shouldn’t just be used for slicing the potato but also other veggies both soft and hard ones. Most people are not usually happy to buy an item that they will only use for a single task. 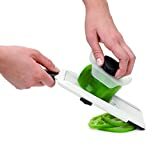 I start with this mandolin slicer because you can use it in almost all the items you want to slice. This is, in fact, a high-quality design item that won’t bother you about its functionality. 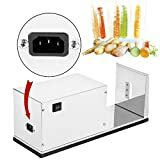 Its versatility makes it ideal because you won’t only use it to cut the potatoes but also the different kind of veggies both soft and hard ones. You won’t find in the market any other mandolin slicer that gives you more options than any other competitor. it does this using 5 of its blades which include the slicer blade, wavy blade, grater, shredder and coarse shredder. With this mandolin, you have all your kitchen needs attended to. It features the high-quality stainless steel blade that is 420 grades hardened surgical stainless steel blade. We all want to make a smart choice, therefore. to prove this to you the company gives you the full lifetime warranty. You don’t have to worry about the plastic that acts as the food holder. It’s a high-quality type that is BPA free, durable and the ABS plastic. It’s further easy to operate and clean in the dishwasher. Although this is not meant for the thin slices only, it has a blade that cuts your regular slices of potato chip and the thin ones. It’s one of the best ones available in the market today with the ability to cut your chip into different shapes and sizes. It has the standard size at the bottom part that makes it easy to fit in the potato of different sizes and shapes. With this bottom side, you have the slicer making it easy to cut out the potatoes. In fact, it works without you having to exert a lot of force. It cuts your potatoes into the French fry shapes. 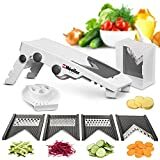 Additionally, you can use this ideal cuter to cut your cucumbers, zucchini, radish, yams and apples among other hard veggies and fruits. What makes it easy to work on your hard food item is that it has a strong handle which is non-slip. You can work with it for long hours. When it comes to cleaning the item it’s more than easy because you only need to spray the water on the food residues before letting it dry out and store. It’s best to have a whole package of the commercial grade potato cutter that is automatic. It takes this machine, a minute to make the 90 runs of an eighth inch thickness of the slices. The machine features a stainless steel make that is also durable and safe to use. You get the twisted design of potato chips with this potato slicer. It further makes the tornado potatoes and veggie snacks. With its stainless steel body construction, it has a longer shelf life than most other potato slicers. It works to start, reverse and once it finishes the potato cutting, it auto stops to protect the blade from breaking. 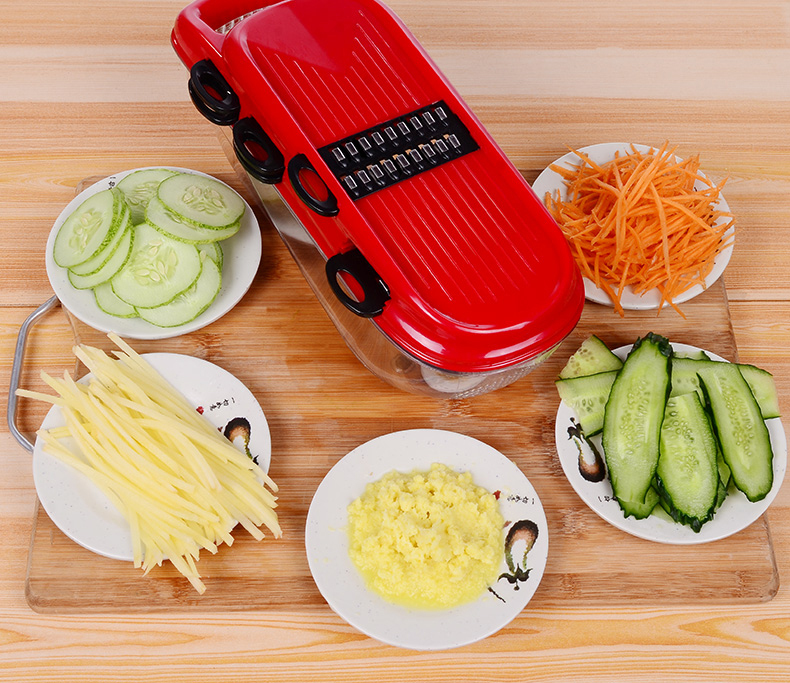 The slicer works best to cut other hard veggies and fruits like zucchini, apples, cucumber among others. 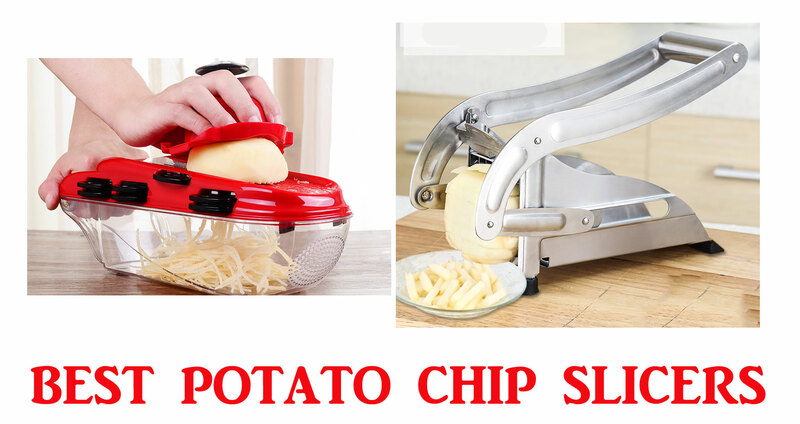 If you love the tornado potatoes, this manual potato slicer will serve you greatly. You may use it for heavy-duty work at home when you have a few guests. The slicer features the rio rand advanced technology that according to most customers is effective for use. It requires zero to low maintenance because all the focus is on reducing the complications that may result from constant usage. It features the stainless steel body construction for corrosion resistance and durability. Its rubber feet offer the firm grip that makes it non-slip and easy to use on your kitchen counter. Meanwhile, its plastic handle won’t slip as you continue to turn it. Use this item to delight your guests at the next party event you are planning. What I like most about the commercial electric slicer is that they operate automatically. You will mostly use it to cut your potatoes into twisted slices of an eighth of the inch. It only uses the 110 V of electricity and 10 watts so you don’t have to worry about the increase in your utility bills. Since you can cut up to 90 runs a minute you can use it for commercial purposes as well as home use. it has a blade that you may automatically replace when it gets spoilt thus enhancing the efficiency. The vevor is your ideal partner beau it’s easy to operate and maintain. Aside from your regular twisted potatoes you may use it for the onions, cucumber and sweet potatoes. It further offers you a comfy grip for easy movement from one place to the other. It will also make you up to 9 slices all at ago. You can also easily multitask with this item since you only need to put the potatoes then let it do the work as you attend to other duties. This feature makes it ideal for use in a busy set up. For all those days when all you need is a slicer to make your salads choose the presto 02970. 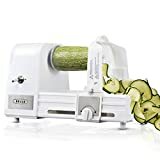 From the veggies to cheese and to fruits this item will work to give you the different cuts in no time. The presto is powered by electricity for automatic operation. 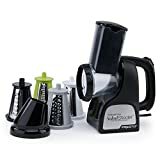 With this slicer, you get 4 interchangeable cones to give you the four different effects which include the regular slices, thick slices, ripple cuts and a handy funnel. You can further use it to chop your nuts, grate the chocolate as you make the bread and cake crumbs among others. Presto body is made using the high-quality stainless steel that is corrosion resistant even when you have used water for longer. Cleaning the item is easy as you only must place other parts of the machine in the dishwasher except for the base. You can wipe it with the regular wipes. Since the parts of the slicer are removable, it makes it easy to clean even the hard to reach parts. This is ideal for those who wish to use it for slicing the veggies at home. You don’t have to buy a large and expensive item when you can utilize this one at a cheaper price. The item is easy to use especially since it keeps your hands safe from cuts. You can use it to produces 3 simple settings the 1 mm, 2.5 mm and 4 mm. You may use the knob to adjust the slicer to the level you want. For stability, slice your veggies on the cutting board, plate or over the bowl. The handheld slicer gives you a firm grip. You don’t have to use force when slicing the food. Softly slide the food over your stainless steel blade and see how perfect the OXO mandolin is up for the task. What’s more, you expect nothing less than the even slices. It has a food holder to protect your hands as you are slicing. Furthermore, it works to protect the blade when you are storing the item. For the cleaning part, you can simply put it in the dishwasher. For those who love the art of cooking, Belle cutter will slice your 6 inches veggies and foods in seconds. You will have a colourful creation to wow your guests. What’s more, this tool being an automatic type releases your hands to take on other tasks. There are those who hate taking different kinds of veggies as they claim they are bland. However, with this tool making artistic creations, you can enjoy the veggies. The best part is that they will come out even and crispy with this spiralizer. Some spiralizers will make your veggies soggy but not Belle. It works when you insert the potato or other vegetables you wish to cut then lock it. You just need to flip your switch and watch as it delivers you the artistic creations. It’s amazing that with a single knob you will create the large ribbons. You don’t have to change the blades since it can cut all your meals. Furthermore, you have the safe cleaning process. You can separate the parts of the spiralizer to have the unit cleaned thoroughly while avoiding bacteria. This has its 2 different blade sizes made using the stainless steel. It features a sturdy construction that has the suction base cups. Since the slicer is made using 100% high-quality stainless steel it is durable for use. The slicer is versatile thus you can use it to cut yams, beets, sweet potatoes and potatoes. 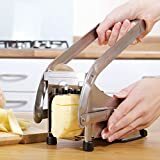 It’s designed to cut both thick and thin potato grips. It, however, limits you to the potatoes of 3 inches sizes. This is to say you must divide the potatoes to the 3 inches level. The blades are designed to cut 32 to 64 potatoes at a time. ICO slicer is so easy to use that you only need to make the simplest manipulation for it to work. What makes it work is that its bottom is designed to assume the shape of the potato. You can adjust your cutter using the grid provided. When the blades are spoilt, you can easily change them. Also, to clean the cutter, simply hand wash it then wipe it before storing. They give you a money back guarantee in case you aren’t satisfied. The mandolin slicer is meant to save you about 70% of the time you spend in the kitchen for preparation. It comes with a food container base, 6 interchangeable blades and finger guard/protector. You may use it to make different unique cuts. In simple terms, this is a spiralizer and mandolin. Your hand slicer features the food grade stainless steel. It’s 6 blades will cut through the different kinds of veggies. 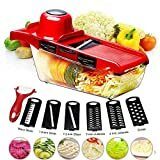 You can use it to grate your cheese, create the pasta like veggies and slice your potatoes among others. For your safety and easy storage, the blades have a container where you could store the blades. This means that you won’t ever have a problem losing the blades. These blades are locked in their place which means even kids can’t interfere with it. 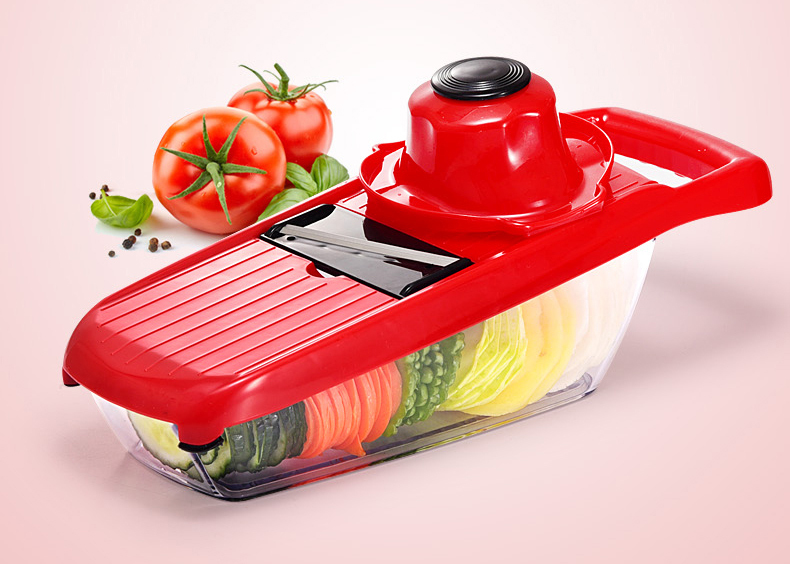 The slicer is set at a tilted angle to make it easy to slice the veggies. Moreover, the silicon base makes it non-slip thus it won’t move around as you are slicing. This item though being a hand tool is easy to use since it makes you have more elegant designs. It comes with the finger guard and ceramic peeler. This set is made using 3 knife pieces that you will use for paring, peeling and slicing. 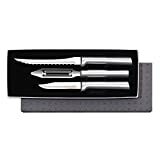 It’s a high-quality set that is made using the surgical blades that are high of carbon and stainless steel. This feature makes it tough and durable. You have a uniquely designed handle that is polished using cast silver brushed aluminum that has the satin finish. Only clean it by hand, not the dishwasher. If you are looking for a great gift buy this for those anniversaries and weddings. 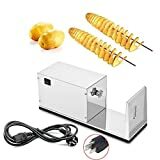 Where Can I Buy the Potato Slicer? The potato slicer happens to be one of the small kitchen appliances which you can get in the kitchen appliance stores near you. But if you like to choose from a variety, go to your best online shop Amazon and other stores. I can’t give a clear-cut decision as to which slicer is the best to buy because they all work differently. You have those that cut the potatoes to slices, others to French fry pieces and even others spiralize them. When buying, know what you want then buy the one with the best features you see.